SQL SERVER 2012 – Fix – Error : 41209 – A semantic language statistics database is not registered. Full-text indexes using ‘STATISTICAL_SEMANTICS’ cannot be created or populated. I came across this error message when I created full-text index on one of the file tables (a new table concept came in SQL Server 2012) and tried to create a full text index. Most likely this error is related to semantic search (a new type of search concept came in SQL Server 2012). Error Message: A semantic language statistics database is not registered. Full-text indexes using ‘STATISTICAL_SEMANTICS’ cannot be created or populated. I tried to create full-text index on file table and received given below error message. The resolution is very simple for this error. Basically, you have attached semantic language statistics database in your SQL Server but most probably you’ve forgotten to register it. Lets debug this error step by step. First of all, lets check whether you registered the semantic database or not. Given below is the script. As you can see that the above query result set is blank, which means semantic database is not registered. Now, you just need to register semantic database, given below is the script. Once you registered the semantic database, execute the Step 1 again and check whether it is registered or not. Given below is the same script but result set would be different because you registered the semantic database. You can view the above result set and see that semantic database has been registered. You can create full text indexes on file tables without any errors. I came across this error message while I was working on one of the file tables (A new table concept came in SQL Server 2012) and tried to create a full text index. Most likely this error is related to semantic search (A new type of search concept came in SQL Server 2012). Error Message: The source table ‘%. *ls’ specified in the SEMANTICSIMILARITYTABLE, SEMANTICKEYPHRASETABLE or SEMANTICSIMILARITYDETAILSTABLE function doesn’t have a full-text index that uses the STATISTICAL_SEMANTICS option. A full-text index using the STATISTICAL_SEMANTICS option is required to use this function. 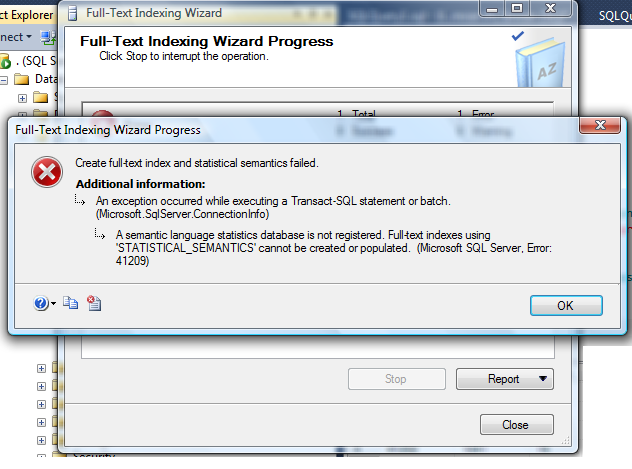 I tried to create full text index on file table and received given below error message. First of all you need to browse the SQL Server installation media and select the given below folder. 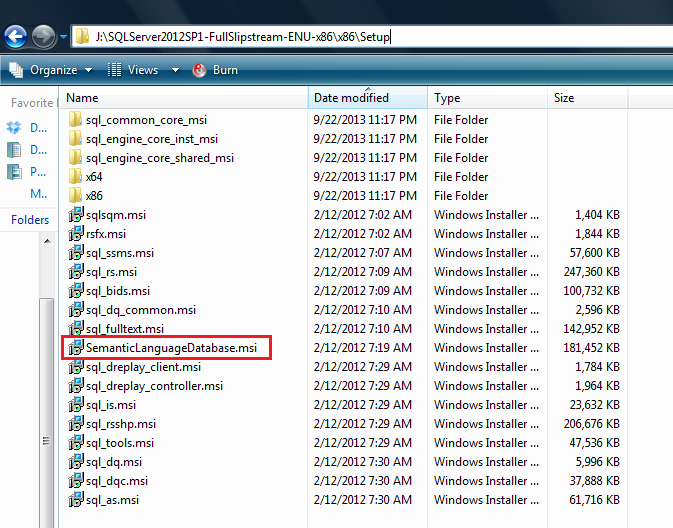 Here you will find a file namely SemanticLanguageDatabase.msi, just execute this file. Given below are the different paths for x86 & x64 machines. Given below is the screen image of this folder. Once you run the above SemanticLanguageDatabase.msi and install it, it will give you two database files (semanticsDB, semanticsdb_log) in a location (C:\Program Files\Microsoft Semantic Language Database), if you install it in the default location. 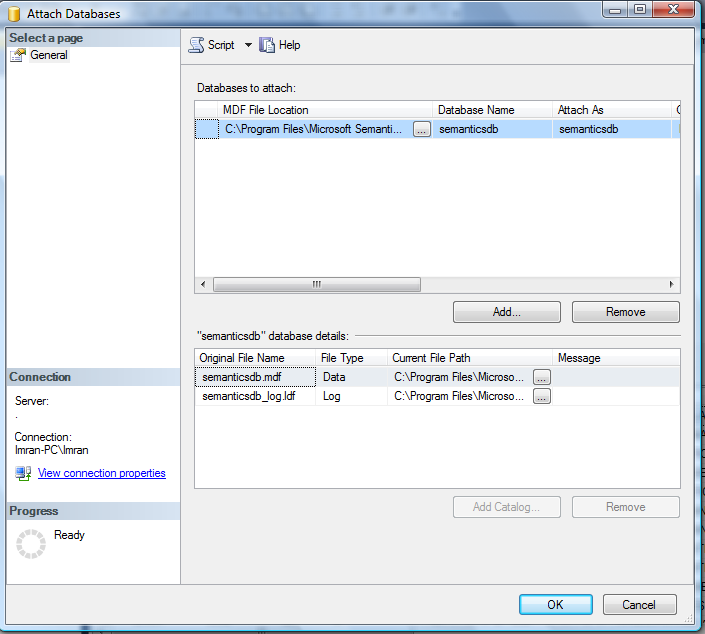 Once we extract the semantic database files (semanticsDB, semanticsdb_log), attach in your database server. Given below is the image. Once you attach the file in your database, just register the semantic database. Given below is the script. Now your semantic database has been registered. You can create full text indexes on file tables without any errors.